The IACP award-winning cookbook Memories of Philippine Kitchens was revised, updated, and re-released earlier this year, and I received a review copy. After years of reading all sorts of food books and publications, I know a little about most kinds of food, but I had somehow managed to never really learn about Filipino food. Amy Besa and Romy Dorotan set out to document native Filipino foods and family histories by asking friends and family about their food memories. The foods of the Philippines have been influenced by China, Spain, Mexico, surrounding Southeast Asian cultures, and the United States, and from one region to another, the traditions are very different. In fact, the authors’ own food memories vary since Besa was born in Manila and Dorotan grew up in Irosin. In researching the book, they traveled to different regions seeking specific ingredients and home cooks still making traditional dishes. Upon returning to Irosin, they learned that Dorotan’s favorite dessert was no longer made because the knowledge of making it wasn’t passed down to the current generation. That struck a chord. It was a good reminder of how important it is to record our favorite dishes. It also made it clear how important this book is as a record of Filipino foods. Because the Philippines are an archipelago made up of more than seven thousand islands, it’s no surprise that seafood figures prominently in traditional dishes. I wanted to try a seafood dish from the book that would be new to me but that I could also make properly without having to substitute items for any difficult to locate ingredients. Ukoy was a perfect fit. The shrimp fritters are made with a rice flour batter, and there’s an interesting frying technique involved that I couldn’t wait to try. First, the batter was mixed with rice flour, all-purpose flour, baking powder, salt, and an egg. It was refrigerated while the other ingredients were prepped. Napa cabbage, carrots, snowpeas, and leeks were julienned. Bean sprouts were cleaned and left to dry, and shrimp was peeled, deveined, and chopped. The vegetables and shrimp were combined with some fish sauce, black pepper, and the batter. A little extra all-purpose flour was sprinkled over the mixture and stirred in to prevent it from being too wet. Oil had been heated in a Dutch oven, and everything was ready for frying. Because the ukoy could easily spread apart and disintegrate in the hot oil, Dorotan developed a technique to prevent that. The idea came from the traditional way of cooking plantain slices on a cacao leaf. 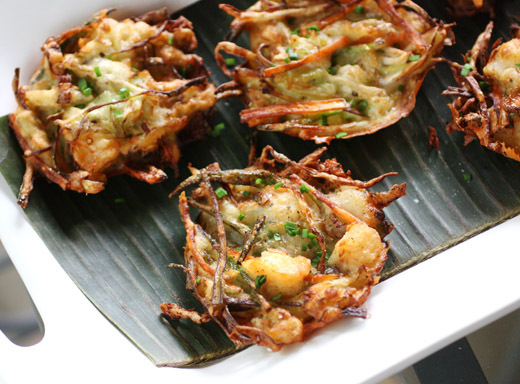 Here, a banana leaf was cut into four-inch squares, the ukoy batter was placed on the squares and then carefully lowered into the oil with a spider. After about one minute, the banana leaf square was removed, and the fritter was left to fry for a couple of additional minutes. The fritters were served with a dipping sauce of vinegar, sliced garlic, and chopped chiles. 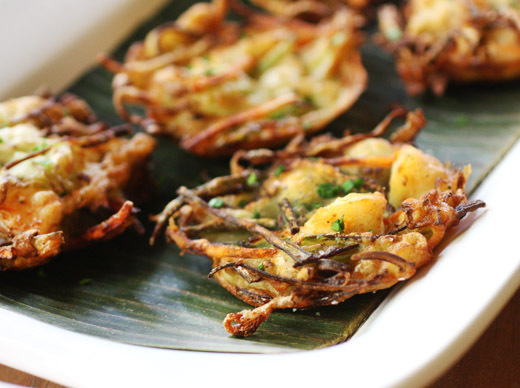 The banana leaf frying technique worked perfectly to keep each fritter intact. I’ll remember that next time I plan to fry something that doesn’t hold together well. Of course the fritters were crispy and crunchy and everything you’d expect from something fried, but they were also fresh-tasting from the vegetables and shrimp with added flavor from fish sauce. I love learning about places through food, and this book provided an incredible tour of the Philippines. Recipe reprinted with publisher's permission from Memories of Philippine Kitchens . 1. Using a damp towel, wipe the banana leaf clean on both sides. Cut out 4-inch squares from the banana leaf. Set aside on a baking sheet. Brush one side lightly with oil. 2. To make the batter, sift the rice flour, all-purpose flour, baking powder, and salt in a large bowl. In a medium bowl, beat the egg with 3/4 cup water, then stir this into the dry ingredients, to form a thick but smooth batter. Refrigerate the batter for 30 minutes to 1 hour. 3. Fill a deep saucepan or wok with 3 inches canola oil and warm over medium heat until the temperature is between 350° F and 365° F.
4. 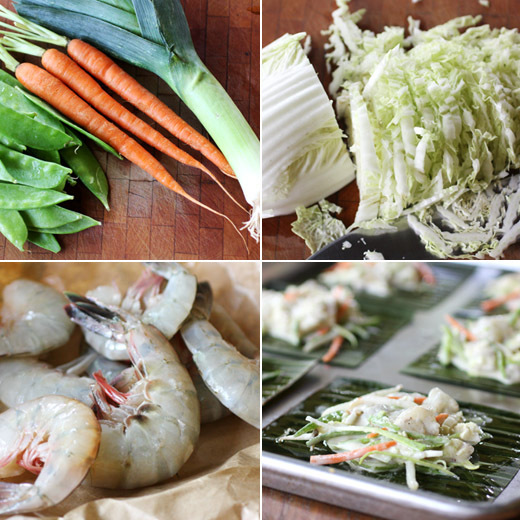 While the oil is heating, prepare the filling: Combine the cabbage, carrots, snowpeas, leeks, bean sprouts, shrimp, fish sauce, and pepper in a large bowl. Stir the batter and pour just enough into the filling to coat the ingredients. Sprinkle 1 to 2 tablespoons over the mixture and toss to firm it up if necessary (it should not be too wet). 5. Put about 1/3 cup of the filling on the oiled side of each banana-leaf square. Place a square on a spider and lower it into the oil. Fry until the fritter is set (about 1 minute), lift from the oil, and remove the banana leaf. Continue frying for another minute until the fritter is lightly browned. Flip and brown the other side until crisp, 1 1/2 to 2 minutes. Lift out of the oil with the spider and place on a paper towel–lined baking sheet to drain. Repeat until all the filling is fried. Serve hot with the vinegar dipping sauce. That is a wonderful speciality! Healthy and really enjoyable. Hi Lisa, just to let you know I had to do the captcha thing four times. It's impossible to read. This is a wonderful, wonderful post, Lisa. Ukoy is one of my *favorite* dishes - I've documented several versions of it in my collection of traditional Filipino dishes, many of them handed down. Good to see my version of comfort food popping up elsewhere. Thank you so much! You always have the most delicious recipes. This one looks wonderful! I've never really eaten or experimented much with filipino dishes either but there's no time like the present to start! These little patties look so tasty! Banana leaf is used a lot as a cooking medium in India....yet I have never seen it used this way. Goes to show how much we still have to learn from each other. Great recipe! What an amazing dish. I love how it's prepared and I'm craving a taste! This looks very delicious! And I like how the banana leaf is used to hold the fritter in the process of frying. I am sure the aroma is imparted to the fritter too! Yum!!! This will be great for a potluck gathering! That is a really cool frying technique. Your ukoy look and sound fabulous! I don't know much about Filipino foods either - maybe it will be the next big ethnic food trend. Now that I think about it, I'm surprised it hasn't blown up yet not that most other Asian foods have been so well mined. The leaf does come out very easily. I actually just used tongs to pull the leaf out after about one minute of frying. Charlie and Sally: Yep, I've noticed the captcha issue on other Blogger sites too. Sadly, we have no control over it other than removing it. Sorry for the inconvenience! i had a coworker from the philippines and she used to bring in the most amazing foods. i loved them, but i've never attempted to make my own. good on you--that plate looks lovely! Now that you mention it; I think I have never done, read or tried food from the Philippines... Which is weird really! But you convinced me to give it a try. The book sounds interesting too! Wow, they look fantastic !!! love to make them. Good tip about frying the on a banana leaf .